Biological Systems Engineering faculty members, Dr. 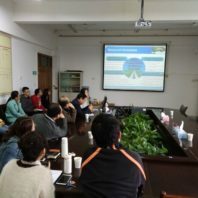 Troy Peters, Dr. Bin Yang, and Dr. Lav Khot, recently traveled to China to collaborate with faculty, students, and scientists at the Northwest Agriculture and Forestry University in Yangling, China. 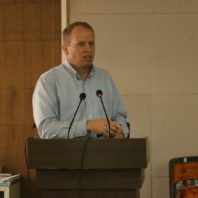 This is part of an international cooperation partnership that the Department of Biological Systems Engineering Department has with this university. 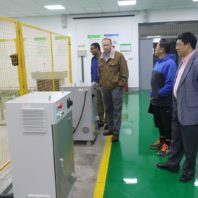 The primary objectives of this visit were to strengthen international exchange and cooperation with this university and encourage additional Chinese Scholarship Exchange students to come do research with WSU in the future. 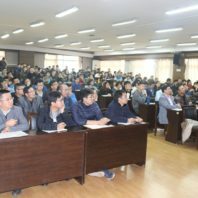 They met with the Dean of the College of Mechanical and Electronic Engineering, Dr. Shaojin Wang, toured the college and gave presentations to almost 200 students and faculty there. 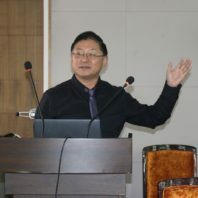 Dr. Peters gave a presentation titled “Irrigation Issues and Advances in the Pacific Northwestern United States,” Dr. Khot gave a presentation titled “Precision Agriculture of Specialty Crops,” and Dr. Yang gave a presentation titled “Overcoming the Challenges of the Next Generation of Biofuels and Bioproducts Production.” In addition, each faculty member met individually with researchers from their specific areas to discuss plans for future collaboration and exchange of ideas. 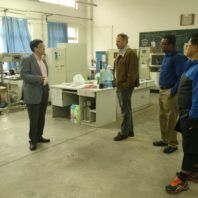 On the way home, Dr. Peters and Dr. Khot also visited Hebei University in Baoding (hosted by Dr. Yongsheng Si). 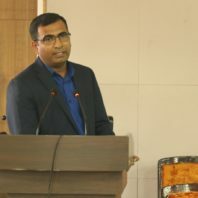 They similarly met scientists and engineers there, gave presentations and discussed plans for cooperation and collaboration for future grant proposals and research.